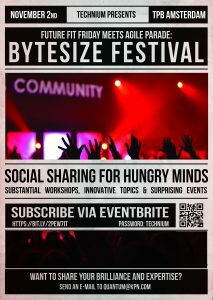 When summer was over we started organising a brand new learning event: KPN Bytesize Festival. A day full of sharing knowledge in an innovative way and connecting with colleagues. The important thing with these learning events is that they shouldn’t feel like a long day of workshops. That is why we aim to surprise the participants with unexpected activities or ways of learning. D-day was finally there. After entering the festival site through ‘strict’ security, the day started with a Daybreaker. A Daybreaker is something that helps breaking through those long 8 hour days staring at a computer screen. Our Daybreaker consisted out of a DJ and a juggler. Just to wake you up and set the bar for the rest of te day. After waking up not-so-slow, they had to pick 6 out of 31 workshops all given by their own colleagues. The topics of these sessions varied from ‘how to solve a rubik’s cube in 3 minutes’ to CI/CD on TCloud via Jenkins’ and ‘making algorithmic music in Python’ to ‘the art of improvisation in the workplace’. During the day the festival vibe went on: The photo-booth, distorting mirrors, a LinkedIn Doctor, the Babble-box, Pimp your ride and the drinks at the end were great energizers to make sure everyone left the Festival with at least as much energy as they came with. You might not expect all the ‘weird’ activities during a training day at an IT organisation. At least, most of the participants didn’t. But it’s important to realise that everyone wants to be surprised at such events. Learning starts outside of your comfort zone and therefore a different surrounding helps. You can go to another venue, or you can change your own surroundings. One of the things we’re really proud of is the fact that we didn’t hire any external people to give a workshop to share their knowledge. Because that would be the easy and common way to organise such a day for your colleagues, right?. We managed to make it a big, BIG team-effort. A lot of knowledge is already there, within the organisation, why not use all that knowledge and share it with your colleagues? The only costs we made were the one for catering and some accessoires. And they are blessed with an in-house DJ! PS Bytesize Festival is last year’s Agile Parade. Click here to read all about the Agile Parade!